Graduate of the BA (Hons) in Exercise and Health Studies at Waterford Institute of Technology (WIT) and captain of the Irish Women’s Rugby Team Niamh Briggs, has been unveiled as the face of a commemorative €1 postage stamp at the GPO. The stamp will celebrate Ireland hosting the 2017 Women’s Rugby World Cup which will take place between 9 – 26 August in Dublin and Belfast. 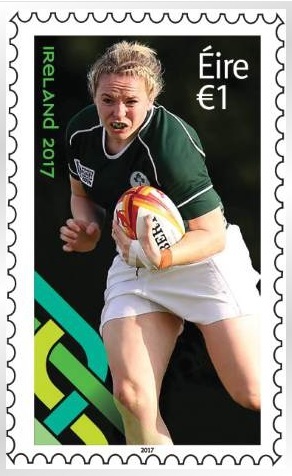 The stamp features an action shot of Niamh during the Irish teams’ historic victory over New Zealand at the 2014 World Cup. Originally from Dungarvan, Co. Waterford, Niamh is a member of An Garda Siochana and is based in Henry Street, Limerick. “It’s such an honour to represent Irish Women’s Rugby on this special postage stamp,” Niamh said. “It marks this special event for Ireland and will really increase awareness of the tournament in the lead-up to the Women’s World Cup. The country has truly embraced Women’s Rugby and the Women’s Rugby World Cup on home soil will be a celebration of all sports and all those who play and support women’s sport,” she continued. Niamh made her debut for the Irish team in 2008 against Italy. Leading on from this, Niamh played for Ireland in the Women’s Rugby World Cup in both 2010 and 2014 and made her International Rugby 7’s debut at the 2016 Rugby Europe Women’s 7’s Grand Prix. Twelve teams will be taking part in the eighth edition of the Women’s World Cup with defending champions England joined by hosts Ireland and Canada, France, USA, New Zealand, Australia, Italy, Wales, Spain, Hong Kong and Japan where the first round of matches will be hosted at UCD with the final matches being hosted at Queen’s University, Belfast.